Well that is what we have called them, anyway. Here we look at a bunch of interesting words that are compound words with two nouns, but with a twist. 1. The two compounds do not have an adjective like:el plato combinado, where combinado is an adjective. 2. The compound word is made of two nouns, and each of the nouns is a different gender. So the word has a male and a female noun together to form like a compound word. Here are some of these examples. Note the gender is determined by the first noun. which is Spanish for swordfish. el pez is masculine and la espada is feminine. So because the first bit, the el pez bit is masculine the word is masculine. 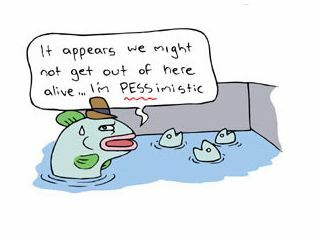 Imagine the male fish (m) is PESSimistic about his future! which is Spanish for sawfish. el pez is masculine and la sierra (saw) is feminine. Again, because the first bit, the el pez is masculine the word is masculine. which is Latin American Spanish for high heel (as in high heeled shoe) or spike-heel. It refers to a sharp heel. el taco is heel easily remembered by imagining your heel crushing a Mexican taco. It is masculine and la aguja, which is a feminine word, is the Spanish word for needle. Note that el taco, as in the thing you buy from a Mexican restaurant is actually a Mexican word when used in the foody sense. Also used el tacón de aguja. is the Spanish word for sofa bed. El sofá is masculine, and la cama is feminine. As taught earlier in this free lesson the new word takes the gender of the first word, which in this case is el sofá . is a Spanish compound word for hammock chair. is a frogman - el hombre being masculine and la rana (spider), a feminine word in Spanish. is the coach that you sleep in, as in one of those buses with sleeping capabilities. is a museum house in Spanish. This might be for example the former house of a famous person, which has been made in to a museum to commemorate the person's life. Note: la casa is feminine, and el muséo is masculine. If you find any more let us know! so we can add them to the lessons. Check the list for many a free Spanish lesson totally free, on many topics. Click for a choice of Spanish lessons on Spanish grammar. This site has lots more lessons free on dozens of Spanish topics. Spanish Compound Words with a feminine and a masculine side!